Tom Petty and the Heartbreakers will tour Australia next month. The group, one of the hottest in America, will appear in Sydney on April 26. Tom Petty says he was raised on rock music. That certainly must be the case for the other members as well. On stage at the Capitol you can expect some of the finest straight rock and roll yet seen in this country. The tour is to be known as Damn the Torpedoes after the title of their current album. Damn the Torpedoes is currently topping the American charts. Full marks to Paul Dainty for managing to get the group while they're hot. Tickets go on sale in Sydney this Wednesday. New Wave group Tom Petty and the Heartbreakers have been making music for the past five years. The purpose of the band, which includes Tom Petty, Mike Campbell, Stan Lynch, Benmont Tench, and Ron Blair, is to "make honest rock and roll" and "to combat disco trance music." The son of a Gainesville, Florida, insurance salesman, Petty started his first at age 13 after seeing girls go wild over Elvis Presley on a movie set. By the age of 17, he had dropped out of school to become a member of the Mudcrutch band. After becoming a local Gainesville attraction, Mudcrutch decided to go to Los Angeles, contacted various recording companies and by the end of the first week they had seven offers. They finally signed with Shelter Records and moved to Los Angeles. But the band soon broke up due to disagreements over song arrangements. 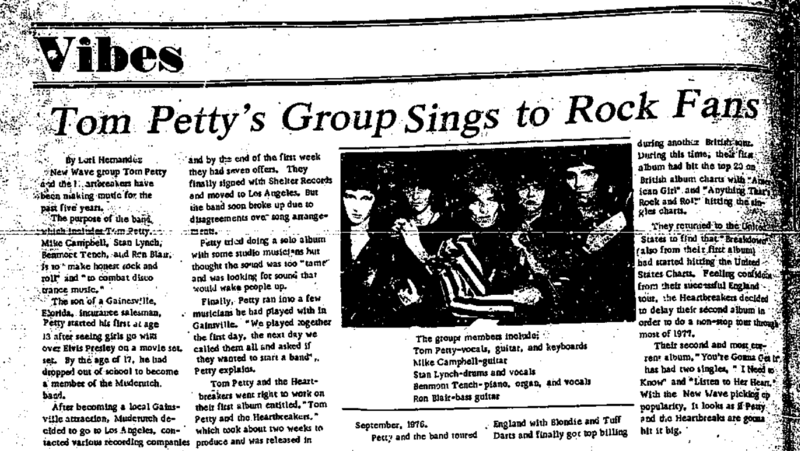 Tom Petty and the Heartbreakers -- Petty and company aren't going to be a one song success. Petty is relaxed now with his new record label, "Backstreet Records." These guys have a lot of material to put out yet. This is definitely one of the most acceptable West Coast New Wave albums to emerge recently, especially if one considers the tremendous plague of cretin-produced, gutless recordings that the recording industry considers fit for public consumption. The most striking quality of this album is the preponderant energy level that the group seems to maintain with little sacrifice in the area of technical or creative integrity. Although Petty's lead vocals reverberate long-forgotten polyphonic of a young, nasal Bob Dylan (specifically on "Refugee"), this vision is dismissed entirely upon listening to tunes such as "Even the Losers" and "What are You Doing in My Life." The group's rocker status is also re-inforced through the purely relentless lead riffs and driving rhythms integral to most cuts. "We're always hearing that we're the future of rock and roll," said Tom Petty last January. "I don't want to be the future -- I want to be the present." 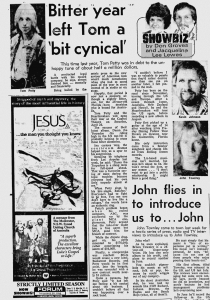 Petty, 28-year-old Florida-born musician, had his wish soon after, when his album, Damn the Torpedoes, hit the top of the U.S. charts. Petty and the Heartbreakers begin their Australian tour with concerts at the Capitol Theatre next Saturday and Sunday. To celebrate, we have 25 copies of the soar-away album from Astor to give away. There's a juicy story behind every Petty song, a slice of his experiences with his record company, friends and the world at large. Tom Petty has rock music in his blood, music that passionately echoes the feelings of normal people and is played at an abnormally blistering pace. Petty's self-assured urgency can be heard on all nine tracks on his latest album "Damn the Torpedoes." 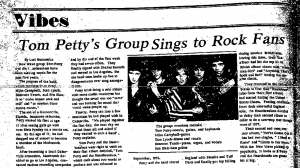 The songs are sizzling reminders that Petty's kind of rock isn't dead, whatever the New Wave Press says. Petty and his band the Heartbreakers have forged themselves a peculiar sound. The music wears the poignancy of Dylan, the melodies of the Byrds and the emotion of Springsteen, and it is capped off with Petty's stinging lyrics and assertive musical phrases. The 28-year-old Florida-born singer snarls his way through the single "Refugee," which is the first contact many people have had with the band. The album and single are both number 24 in Australia. 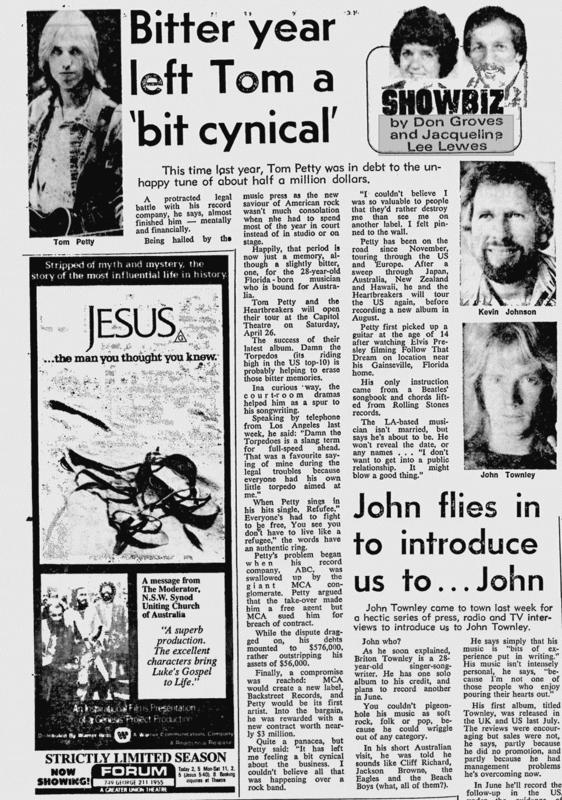 In America Petty is huge, not only because his music is refreshingly down-to-earth and sincere but he has earned hero status as a purveyor of America's rock and roll tradition, following in the wake of Dylan and Springsteen. It's not that there is anything particularly bad about the music of Tom Petty and The Heartbreakers. They all play and sing proficiently enough, but the music is just not all that interesting. The Americans regard The Heartbreakers as New Wave rock and roll. At the Capitol on Saturday night in fact, they presented the currently acceptable end of Heavy Metal -- subtley took a back seat as the audience lapped up Petty's relentless performance. Not surprisingly then, it was the occasional quiet moment that became the highlight of the concert: songs like Fooled Again, Luna, and Refugee, where Petty had a chance to show off his voice to best advantage.